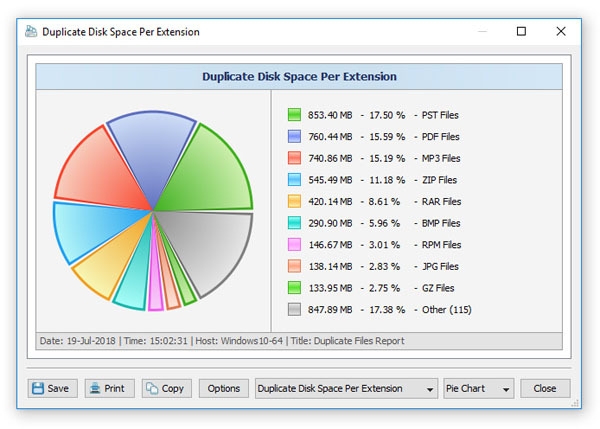 DupScout is a duplicate files search and removal solution allowing one to search duplicate files in disks, directories, network shares or NAS storage devices. The user is provided with the ability to review detected duplicate files, generate reports, replace duplicate files with shortcuts or hard links, move duplicate files to another directory, compress and move duplicates or delete all duplicate files. DupScout allows one to save HTML, PDF, Excel, text, CSV and XML reports. Advanced users are provided with the ability to export reports from multiple servers to a centralized SQL database and perform history trend analysis operations. 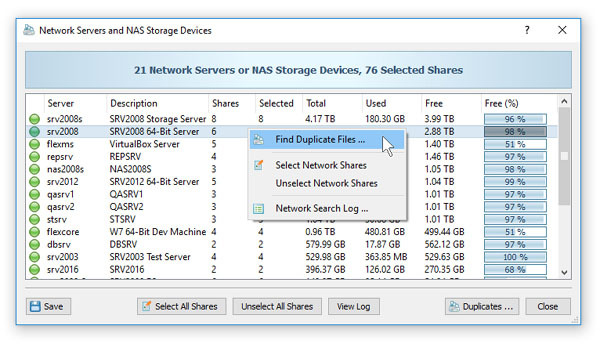 DupScout allows one to scan the network, discover network servers and NAS storage devices, automatically detect all accessible network shares and search duplicate files in hundreds of network servers and NAS storage devices. In addition, the user is provided with the ability to export the list of detected servers and NAS storage devices (including lists of network shares for each server) into HTML, PDF, text and CSV reports. In order to search duplicate files in one or more servers or NAS storage devices, press the 'Network' button located on the main toolbar and wait while DupScout will scan the network and show a list of detected network servers and NAS storage devices. 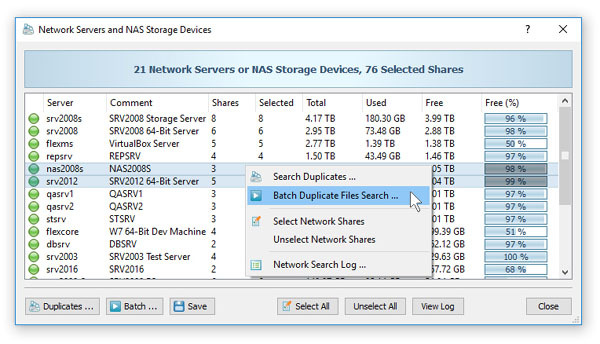 On the network servers and NAS storage devices dialog, select the required servers and press the 'Duplicates' button. DupScout will show all network shares hosted on the selected servers and NAS storage devices allowing one to search duplicate files and save various types of charts and reports. 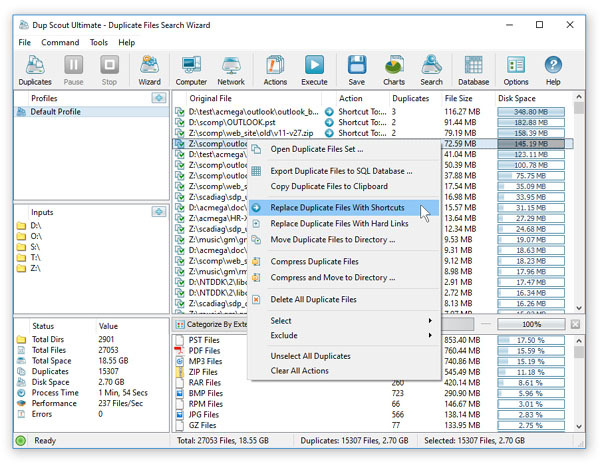 In addition, DupScout provides a large number of advanced duplicate files search options allowing one to tune and customize duplicate files search operations for user specific needs and hardware configurations. 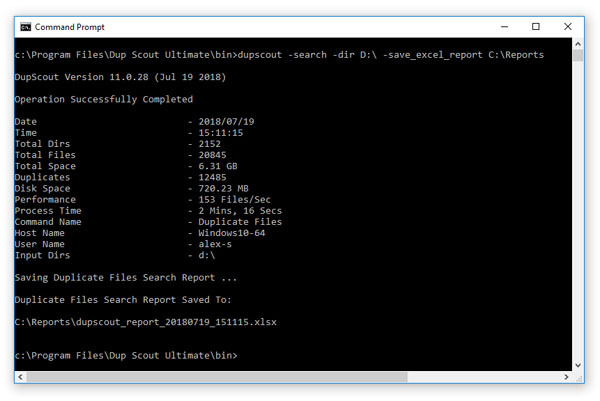 In addition to the desktop application, DupScout Ultimate and DupScout Server provide a command line utility allowing one to perform automated duplicate files search and removal operations or control one or more DupScout Servers via the network. The DupScout command line utility provides a large number of command line options allowing one to search duplicate files, save HTML, PDF, Excel, text, CSV and XML reports, export duplicate files to an SQL database and execute duplicate files removal actions. The DupScout command line utility may be used to execute duplicate file search profiles pre-configured in the DupScout GUI application. Power computer users and IT professionals are provided with the ability to fully-automate duplicate files search and removal operations by integrating the DupScout command line utility into custom shell scripts and batch files. In addition, to the desktop product versions, enterprises and IT professionals are provided with two server-based product versions, DupScout Server and DupScout Enterprise, which run in the background as a service and allow one to search duplicate files in servers and NAS storage devices over the network. Server-based product versions are especially optimized for multi-core and multi-CPU servers and can search duplicate files in tens of servers and/or NAS storage devices simultaneously. The server product versions provide advanced duplicate files search, removal, reporting and history trend analysis capabilities and may be controlled using a full-scale client GUI application and the DupScout command line utility locally or via the network. 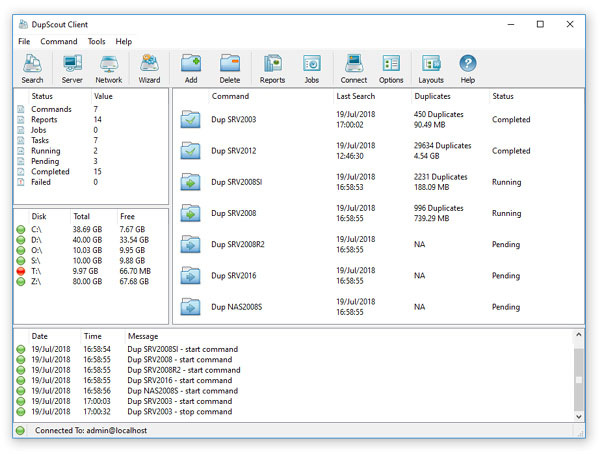 The DupScout Server client GUI application provides a full set of features available in the desktop product version and additional capabilities allowing one to perform multiple, parallel duplicate files search operations, schedule periodic duplicate files search operations and perform history trend analysis operations. Finally, DupScout Enterprise provides a web-based management interface allowing one to control one or more servers using a regular web browser through the network and provides the ability to perform duplicate files search operations, save various types of reports, perform history trend analysis, remove duplicate files, schedule periodic duplicate files search operations, etc. 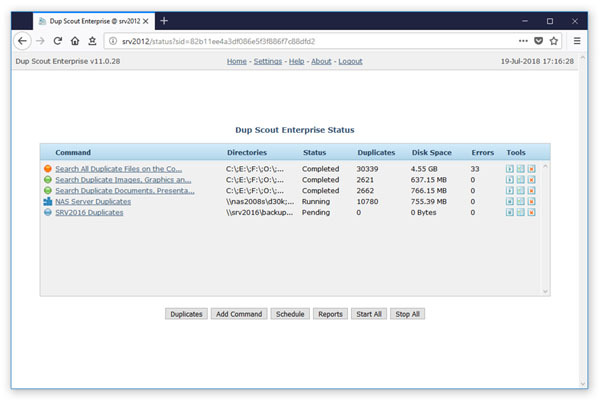 DupScout Server and DupScout Enterprise provide the ability to scan the network, detect all network servers and NAS storage devices, execute one or more pre-configured duplicate files search commands on hundreds of network servers and NAS storage devices and generate an individual duplicate files report for each server, NAS storage device or network share. In the simplest case, just press the 'Network' button located on the main toolbar, search all network servers and NAS storage devices on the network, select one or more servers, press the right mouse button and select the 'Batch Duplicate Files Search' menu item. 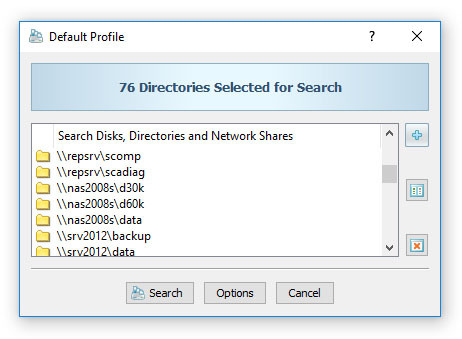 DupScout will show a list of pre-configured duplicate files search commands allowing one to select one or more commands to be executed on all selected network servers and NAS storage devices. 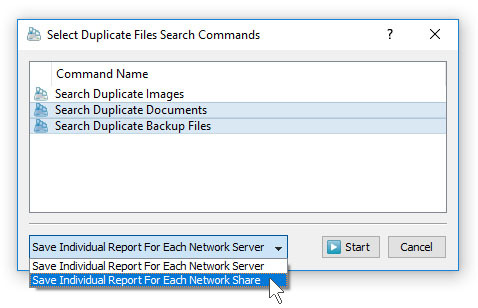 Depending on the selected configuration, DupScout will save in the built-in reports database an individual duplicate files report for each network server, NAS storage device or network share. 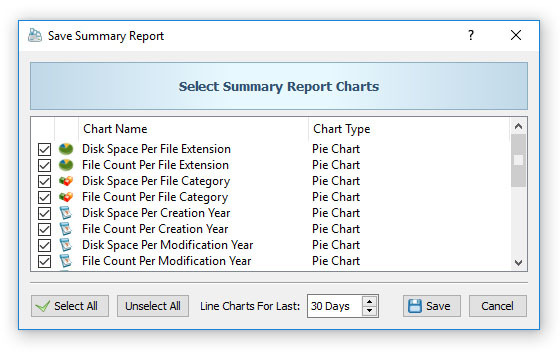 Once the batch duplicate files search operation is completed, the user will be provided with the ability to open saved duplicate files reports, review results, generate various types of pie charts and export reports to a number of standard formats including HTML, PDF, Excel, text, CSV and XML.